Bitterballen are popular party food in the Netherlands. They are breaded and deep fried, and usually filled with a meat ragoût. I have already blogged about those here. When they are larger and have a cylindrical shape, they are called kroketten. 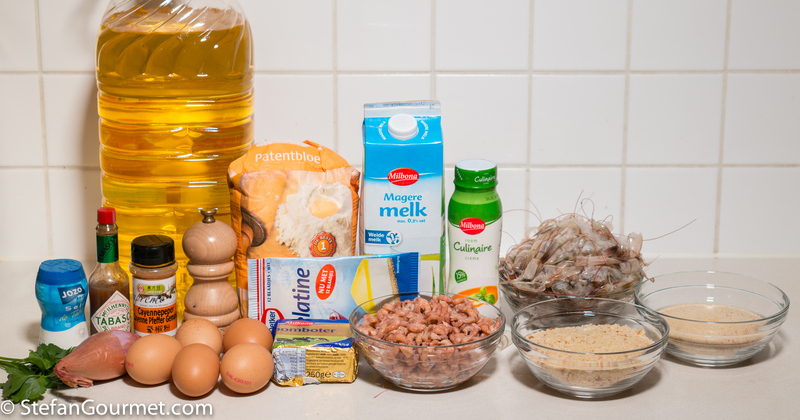 Another famous variety is made with shrimp ragoût, resulting in garnalenbitterballen or garnalenkroketten. 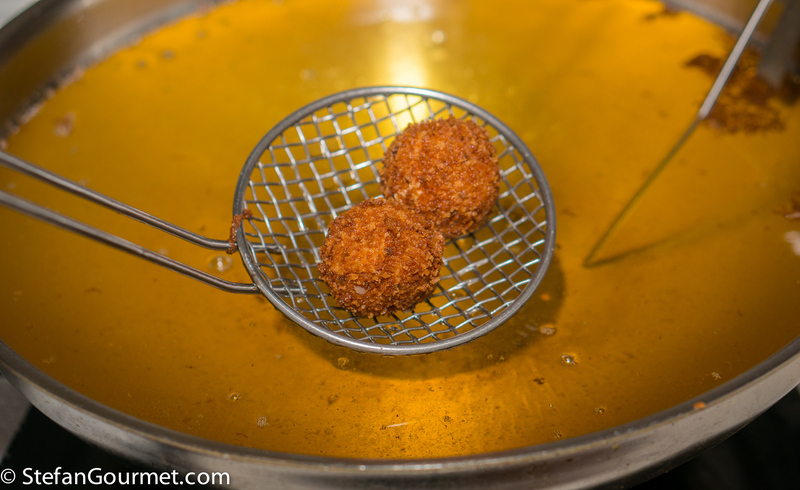 This version is also famous in Belgium, under the slightly different spelling of garnaalkroketten. 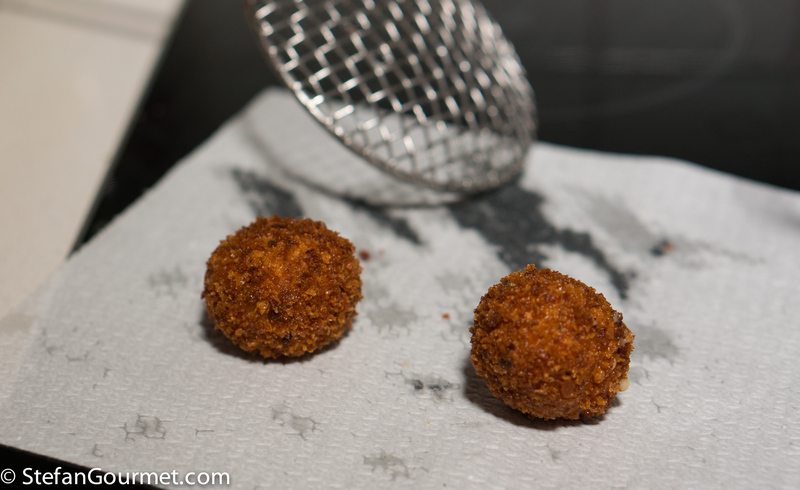 The balls are served as a party snack, the croquettes as an appetizer (about 2 per serving, with a slice of lemon). 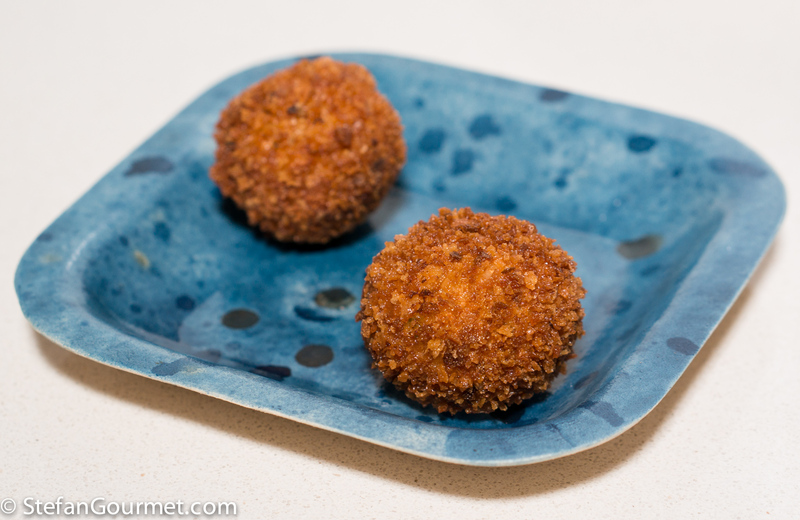 For real Dutch (or Flemish) shrimp croquettes, you will need the small shrimp that are caught in the North Sea. They are a pain in the (beep) to peel, but they have more flavor than their larger cousins. The shrimp are boiled in sea water as soon they are caught. You have the option to buy them like that, so you peel them yourself, or buy them already peeled. In both cases they are already boiled. 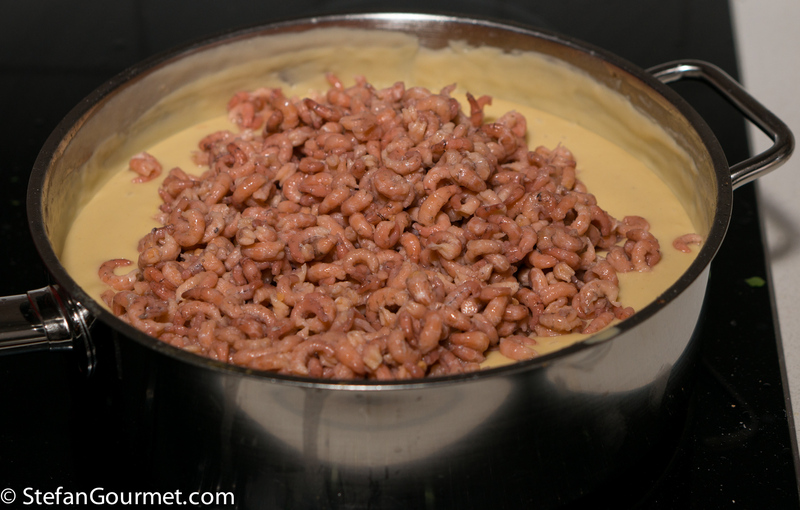 To distinguish them from their larger cousins, they are called Hollandse garnalen (Dutch shrimp) here. In French they are called crevettes grises (grey shrimp). 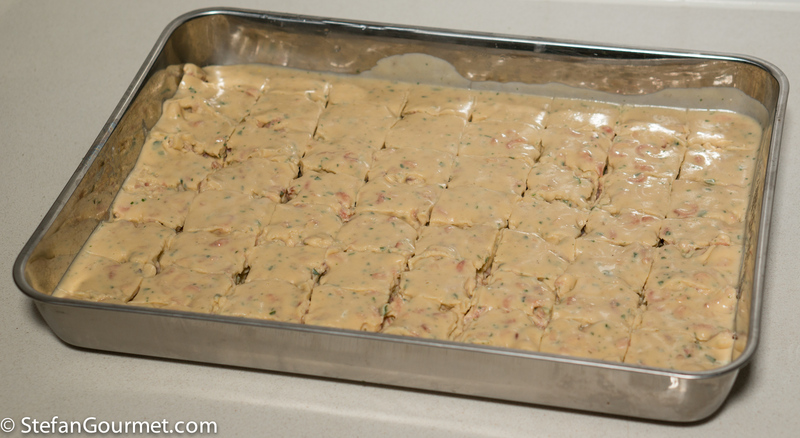 If these small shrimp are not available to you, you can also make this with regular shrimp. 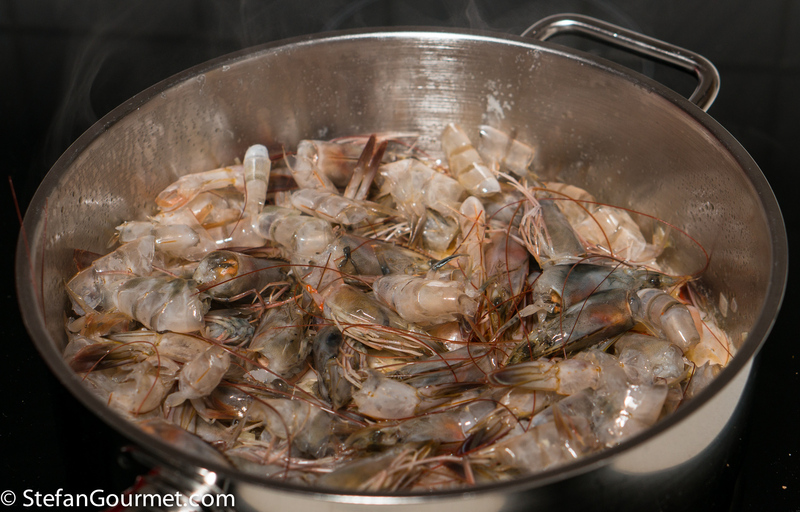 Just make sure you buy shrimp with heads and shells, as you will need those to make the shrimp stock. This is what gives the ragoût its flavor. 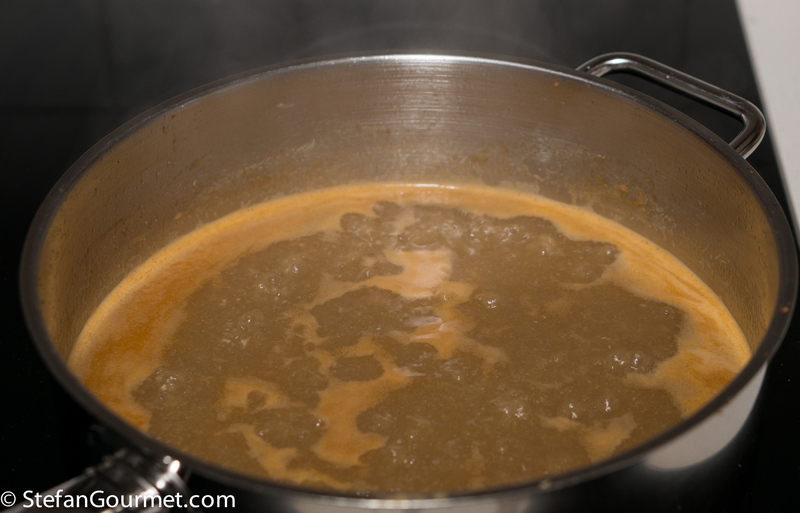 I’ve seen recipes that use fish stock instead, but it is not the same. 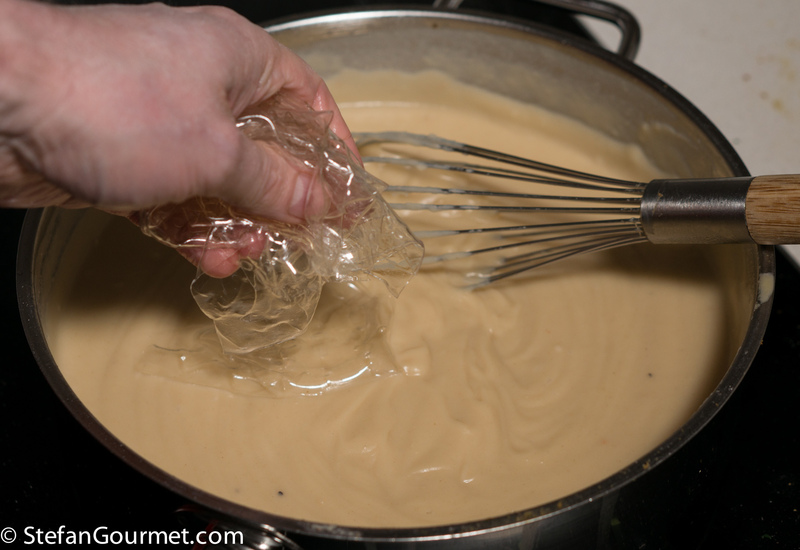 Gelatin is used to make the ragoût firm enough when it is cold to shape the croquettes. 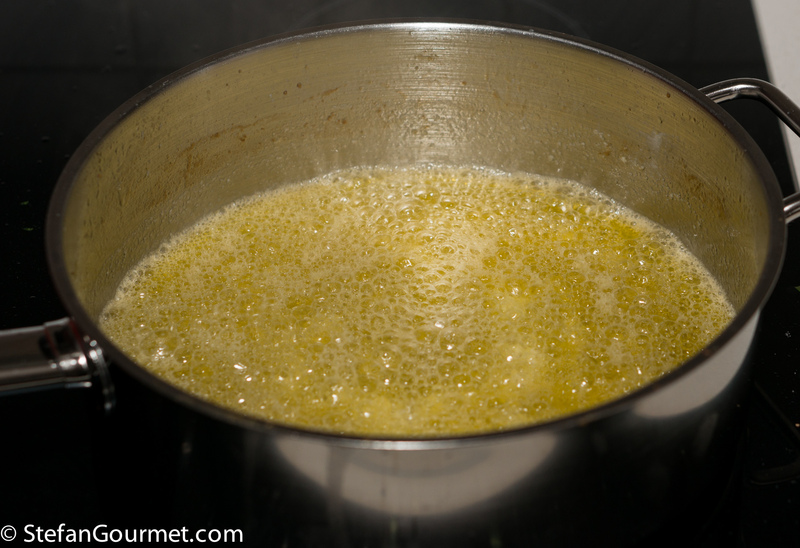 When it is hot the ragoût will be liquid again, so the croquettes will be runny (as they should be). I used the recipe of retired pastry chef Cees Holtkamp. I made a few small changes, the most important being that I did bought already peeled small shrimp, and used shrimp heads and shells from my freezer. The secret to a crispy crust is to use two layers of breadcrumbs: the first layer with regular (fine) breadcrumbs, and a second layer with coarse breadcrumbs. 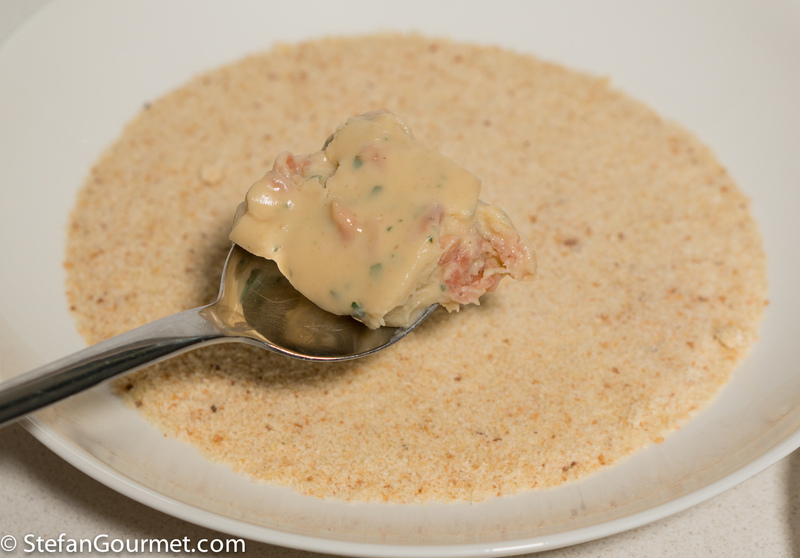 In this post you can read how to make fine and coarse breadcrumbs yourself from old bread. You can also use panko for the coarse breadcrumbs. As the ragoût needs to firm up overnight, you need to start at least one day ahead. 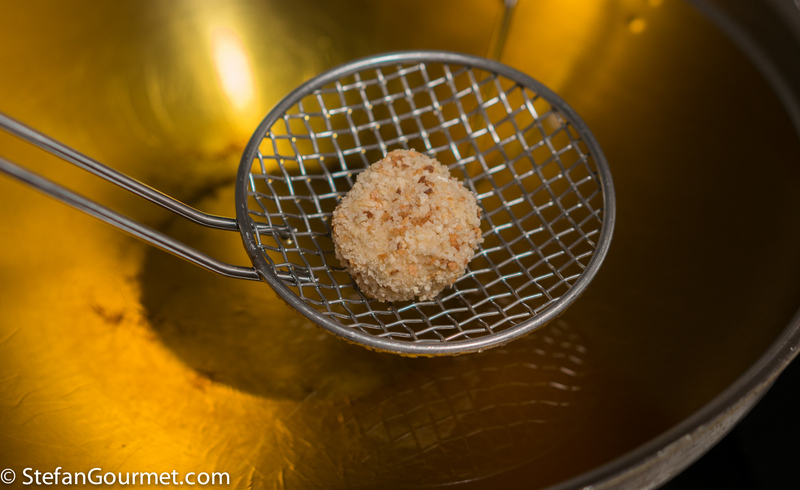 The raw croquettes can be frozen and should then be deep fried without thawing them first, allowing an additional minute or so of deep frying time. 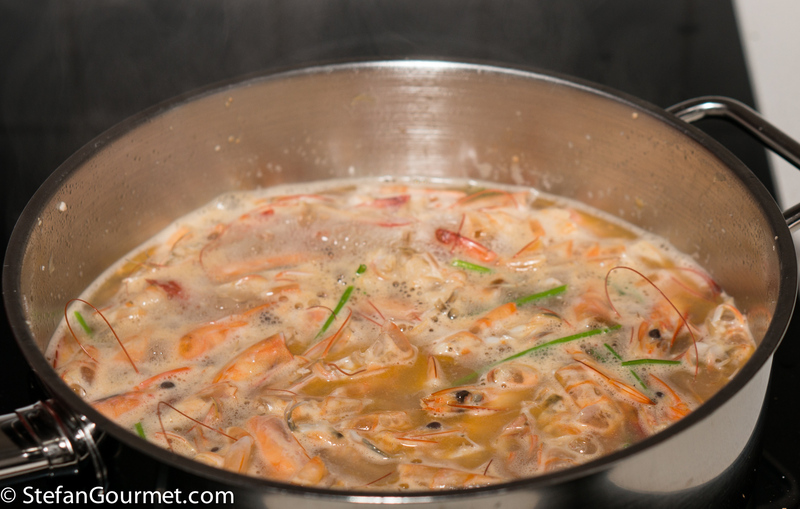 Start by making the shrimp stock. 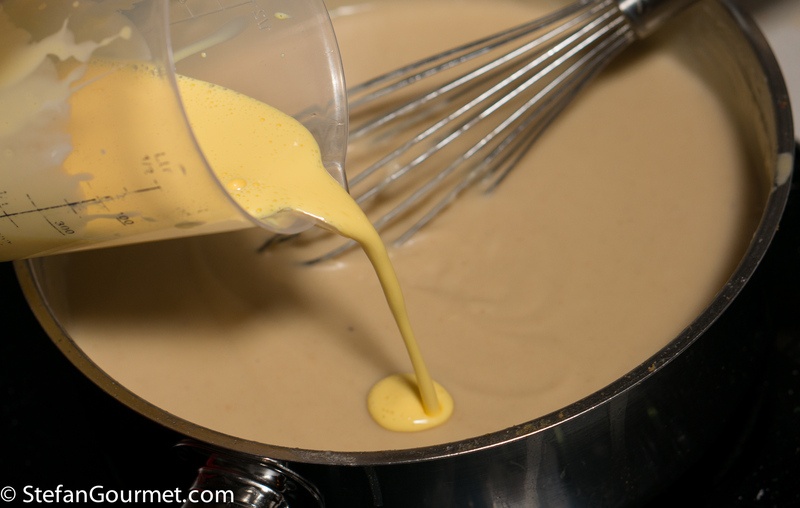 Melt a tablespoon of butter in a frying pan. 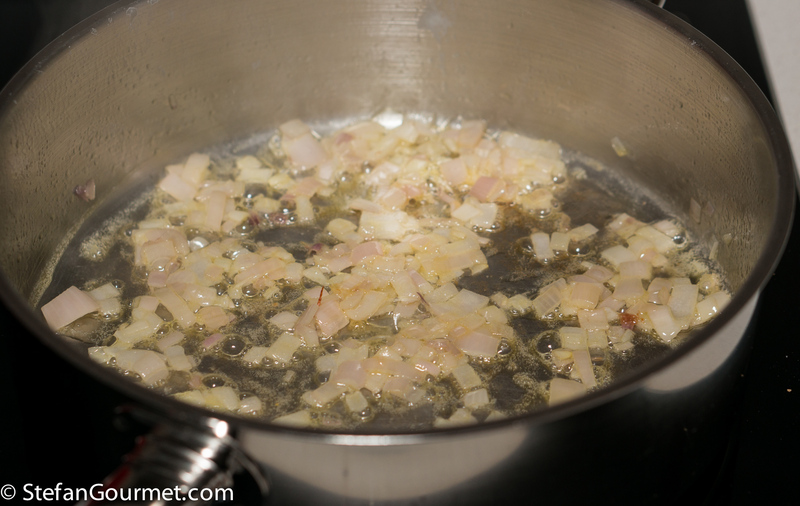 When the butter foams, add a minced shallot, and stir over medium heat until the shallot is translucent. Now add the shrimp heads and shells. 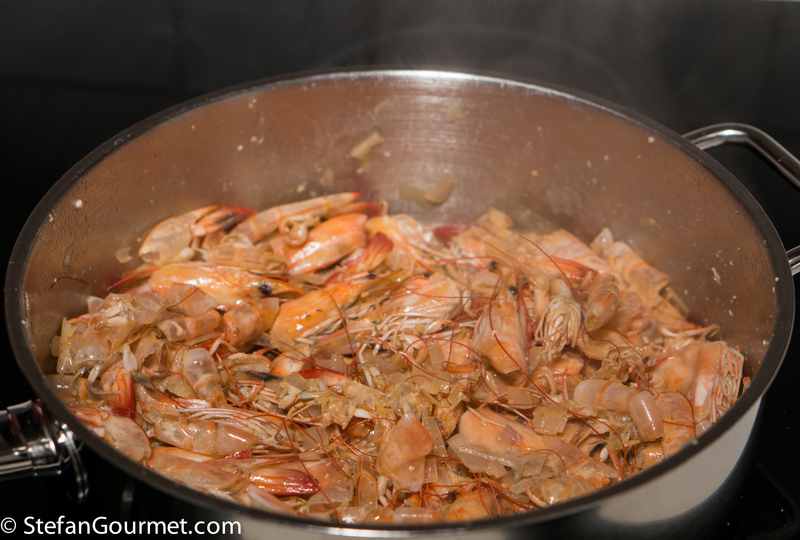 Stir over high heat until the shrimp heads and shells are pink all over. 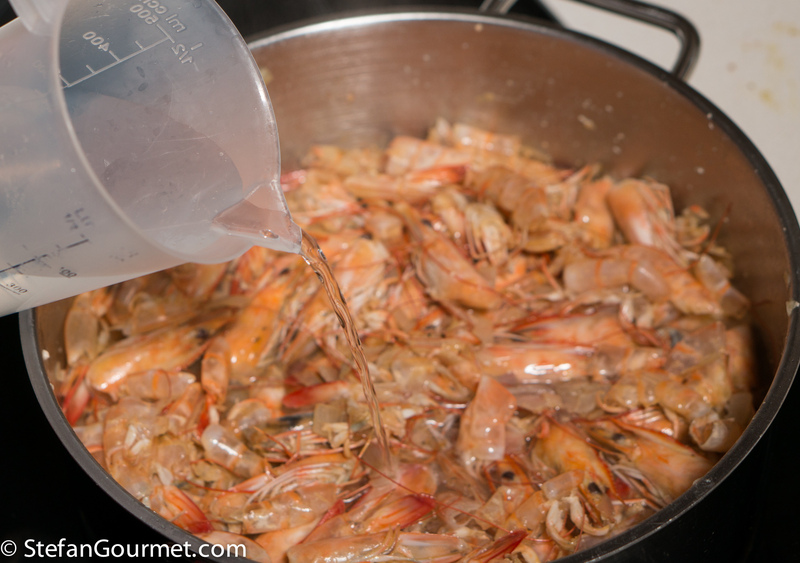 Add 250 ml (1 cup) of water, or a bit more if needed to cover the shrimp heads and shells. Add the stalks of the parsley, and bring to a boil. 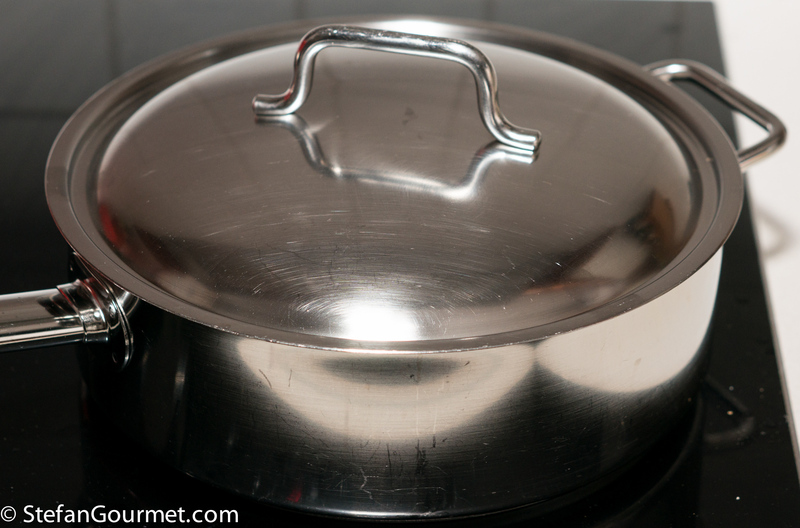 Cover and allow to simmer over low heat for 20 minutes. 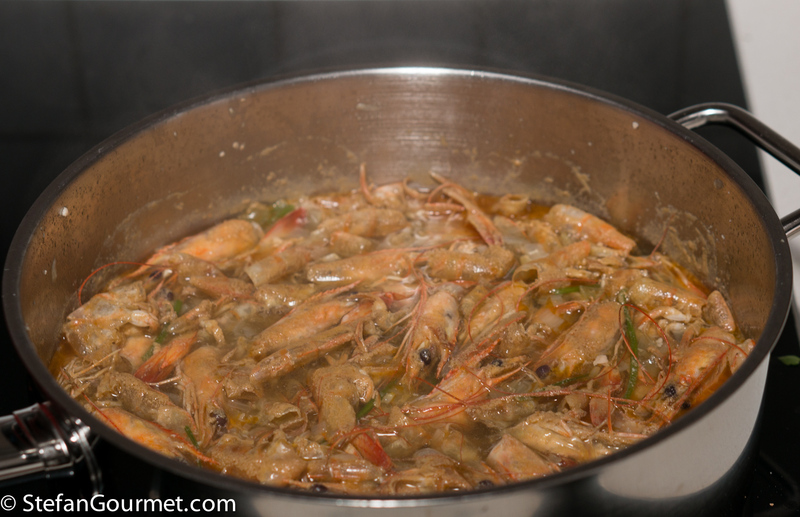 The shrimp heads and shells have now given off their flavor to the stock. 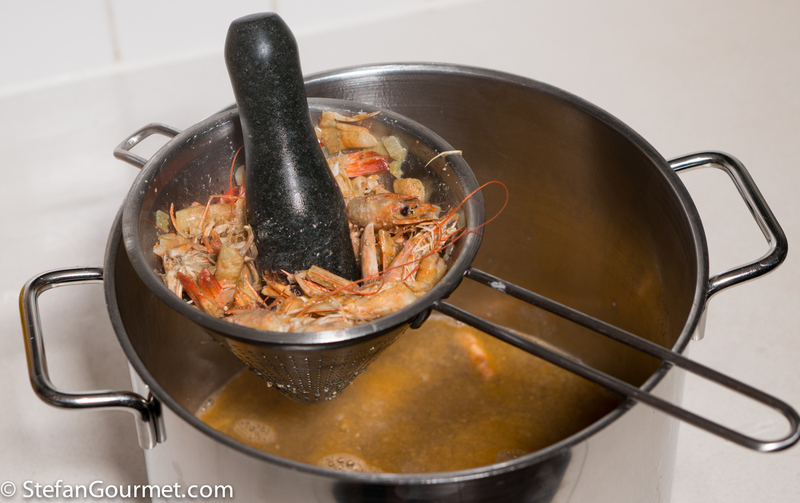 Sieve the stock, and get as much flavor and juice out of the shrimp heads and shells using a pestle and a chinois or sieve. 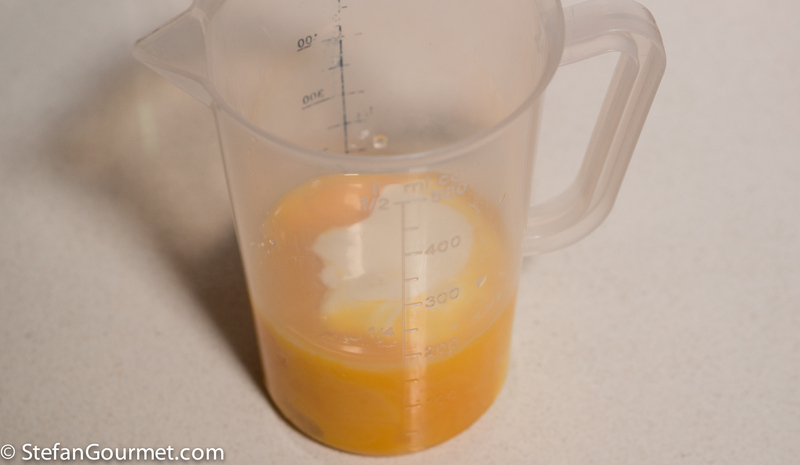 If needed, reduce the shrimp stock to 250 ml (1 cup). 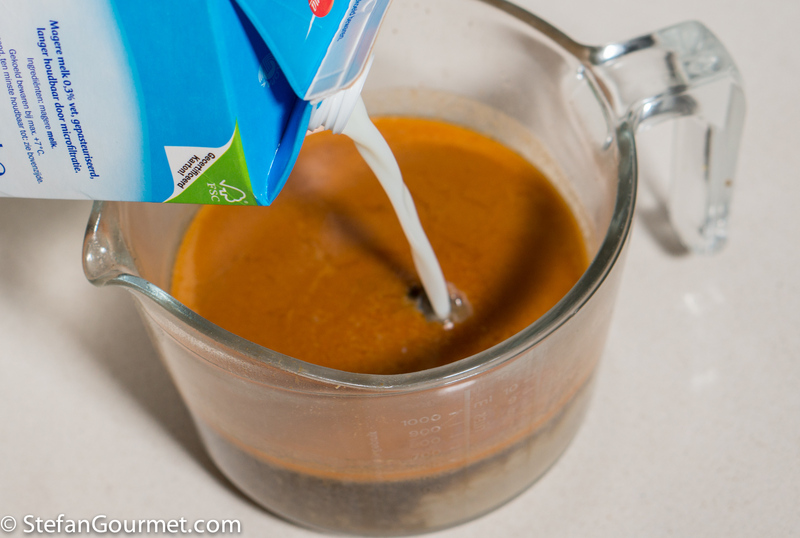 Combine the stock with 250 ml (1 cup) of milk. 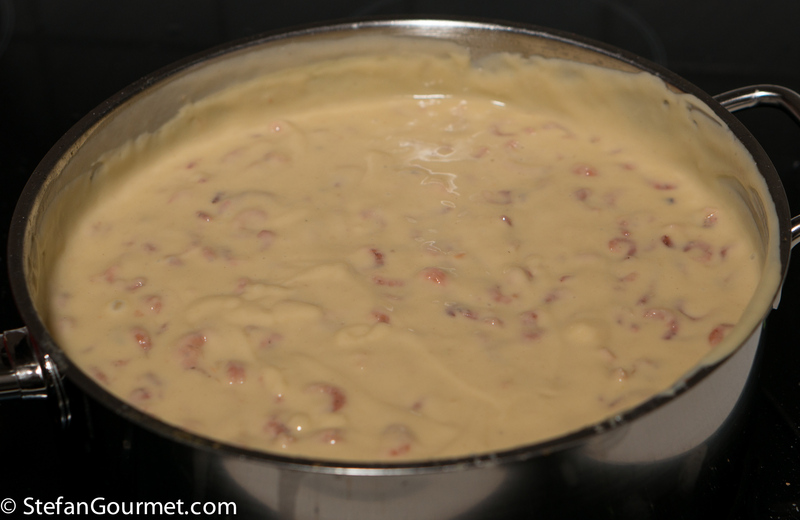 Melt 80 grams of butter in a frying pan. Allow it to foam, but make sure it won’t brown. 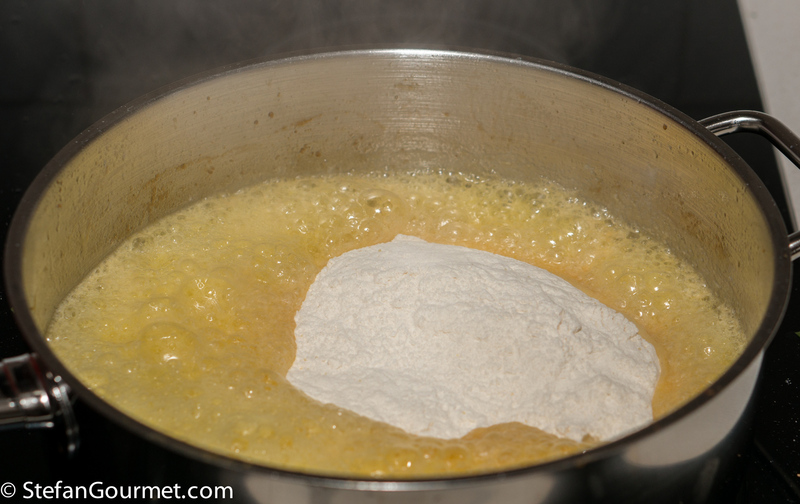 Lower the heat and add 100 grams of flour. 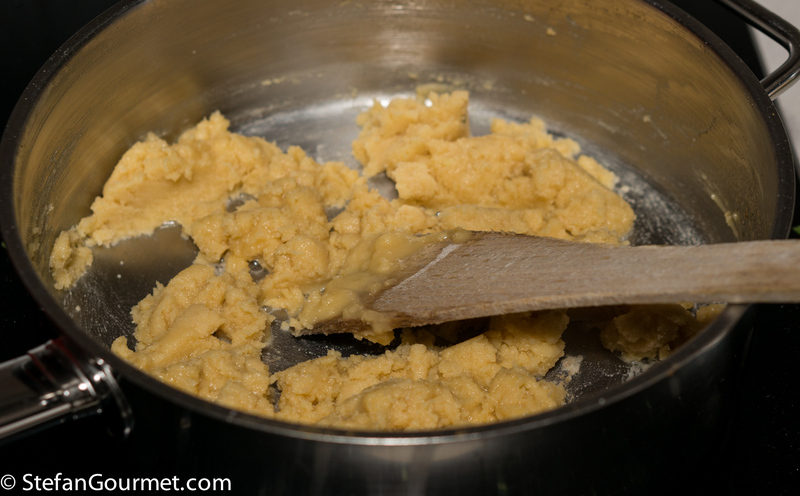 Stir over a low heat for a couple of minutes until the flour and butter are well mixed. 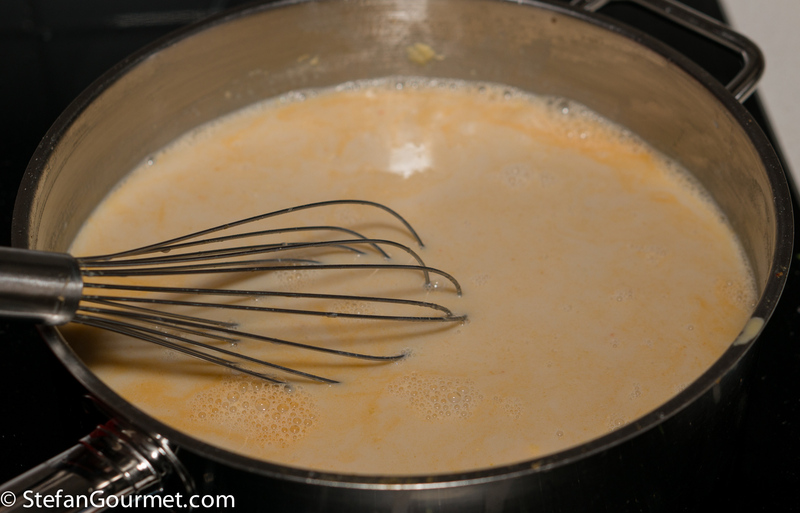 Whisk energetically over medium heat. 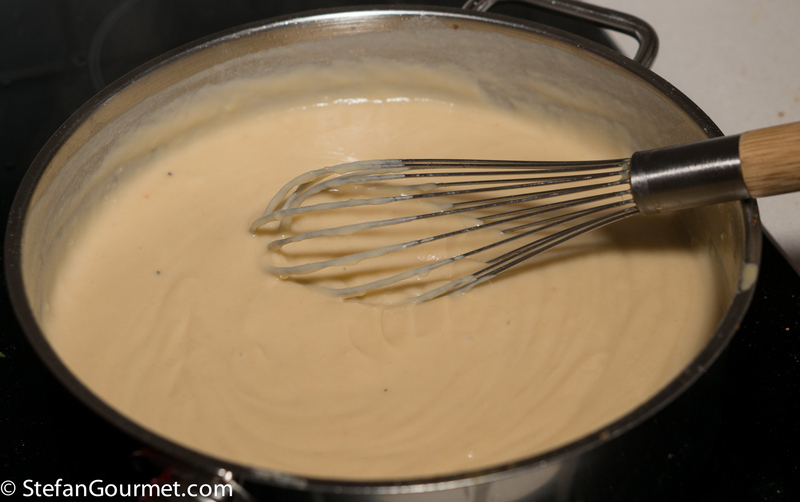 Keep whisking until the ragoût is thick. A thicker ragoût will make it easier to shape the croquettes later on. Turn off the heat. 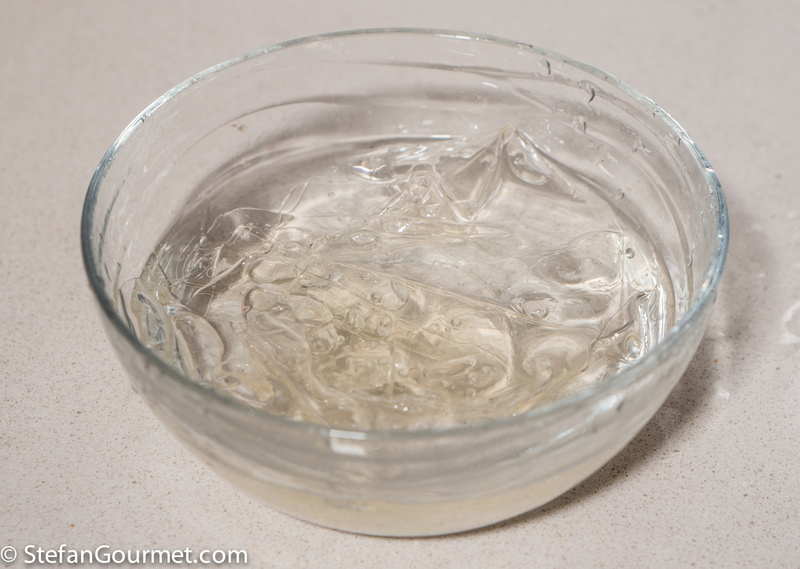 Squeeze the water out of the gelatin and then dissolve it in the ragoût. 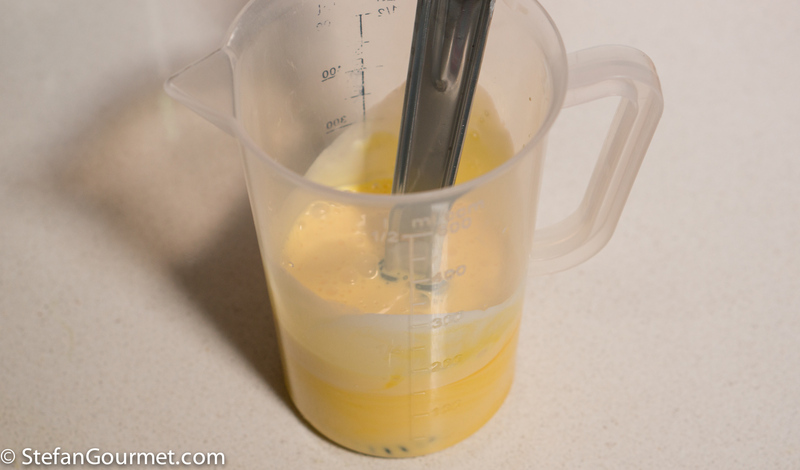 Combine 2 egg yolks with 50 ml of cream. 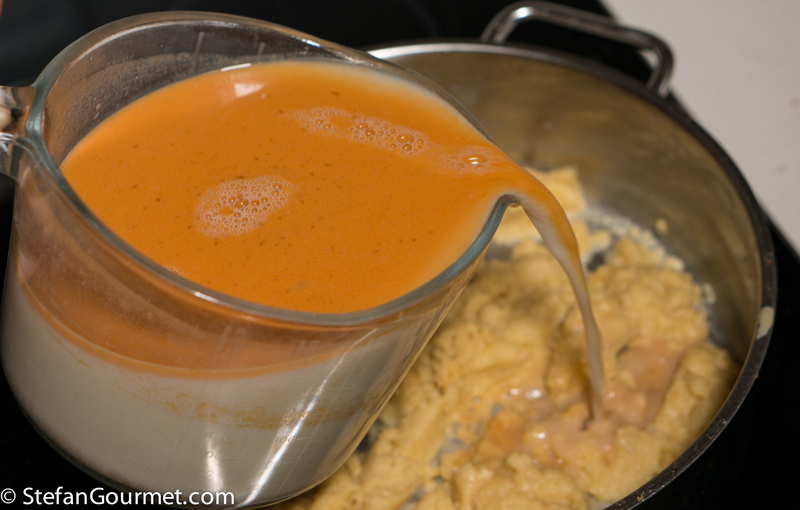 Add this mixture to the ragoût. Stir to incorporate. Season to taste. 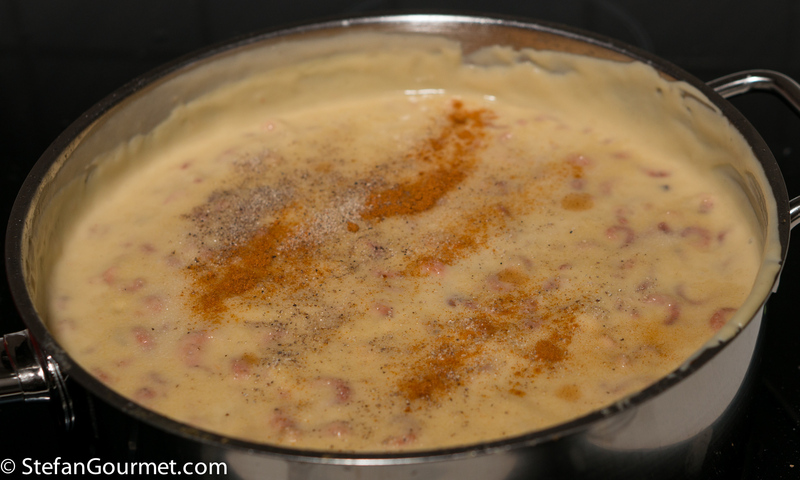 I used 3/8 tsp white pepper, 1 1/2 tsp salt, 1/8 tsp cayenne pepper, and 6 drops of tabasco. 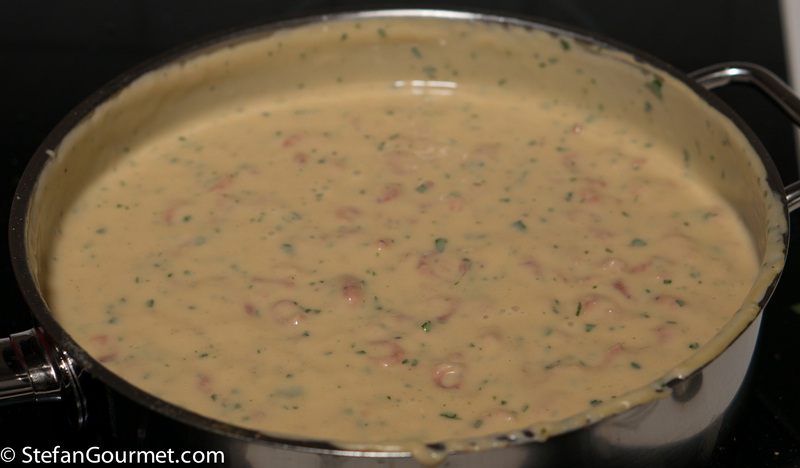 Add a tablespoon of minced parsley, and stir to incorporate. 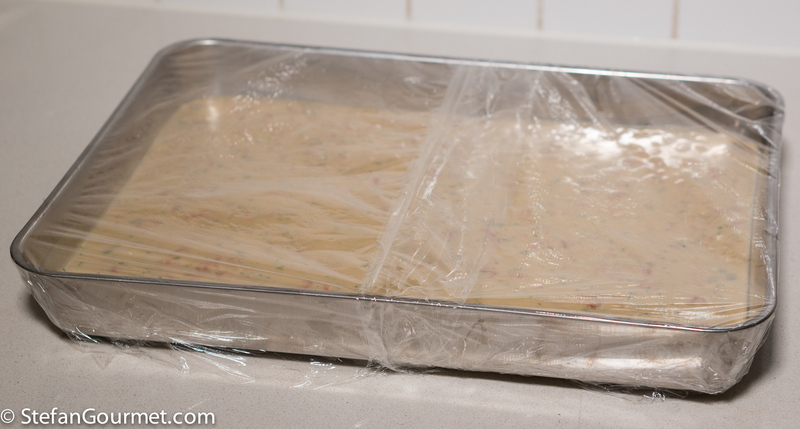 Allow the ragoût to cool and firm up overnight in the refrigerator. 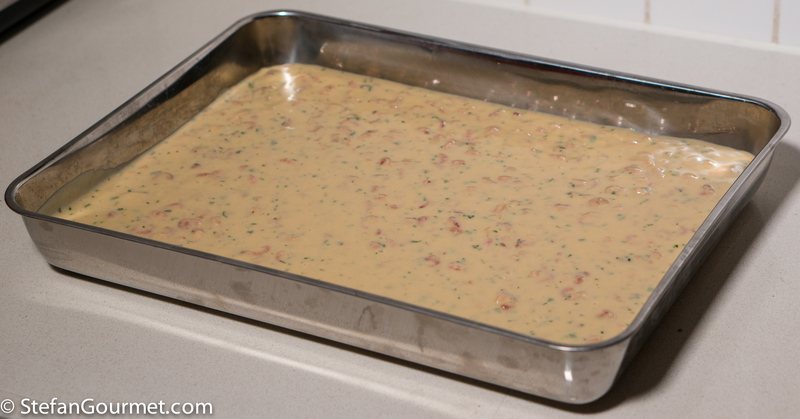 I transferred it to a wide rectangular dish to make it easier to divide the ragoût into equally sized balls. 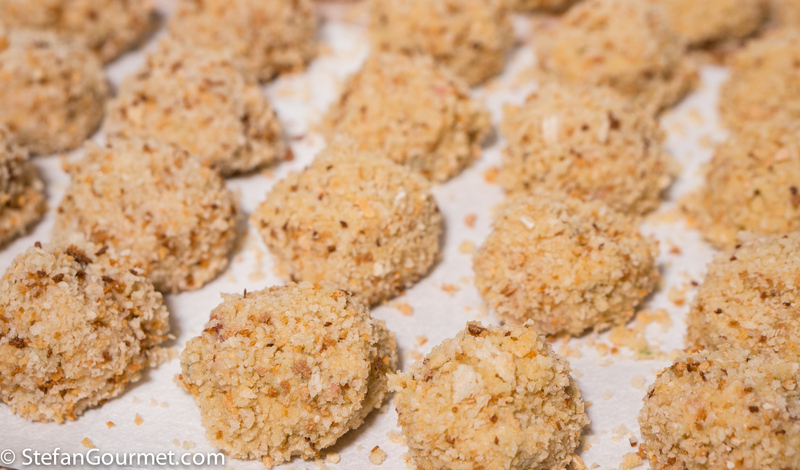 Take each portion of ragoût using a tablespoon, and roll it into a ball (or croquette) in fine breadcrumbs. Repeat until you have used up all of the ragoût. 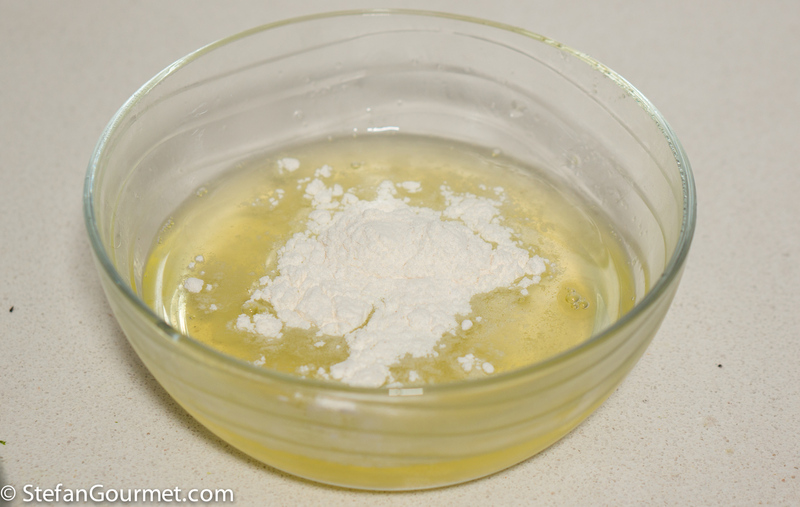 Combine 5 egg white with a tablespoon of flour, then wish to mix. 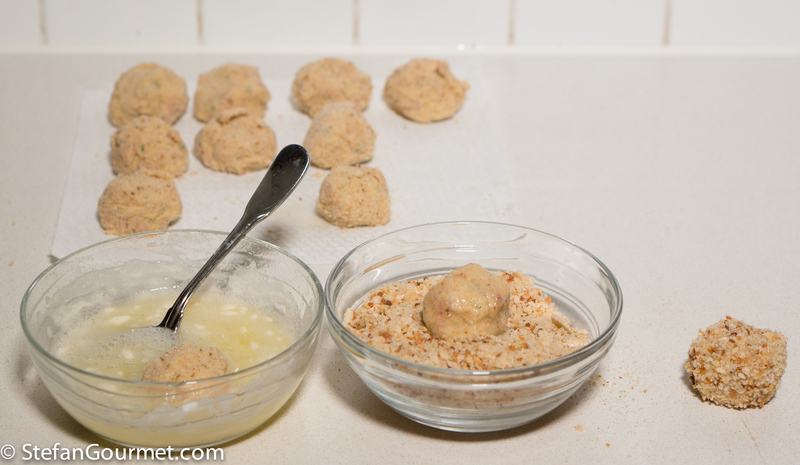 Dip each ball first in the egg white mixture, making sure to cover it completely, and then in the coarse breadcrumbs, again making sure to cover it completely. Otherwise there will be leaks when you deep fry. Keep going until you have finished all of them. You can deep fry them at once, or store them in the refrigerator for up to a day (making sure to turn them at least once), or in the freezer. 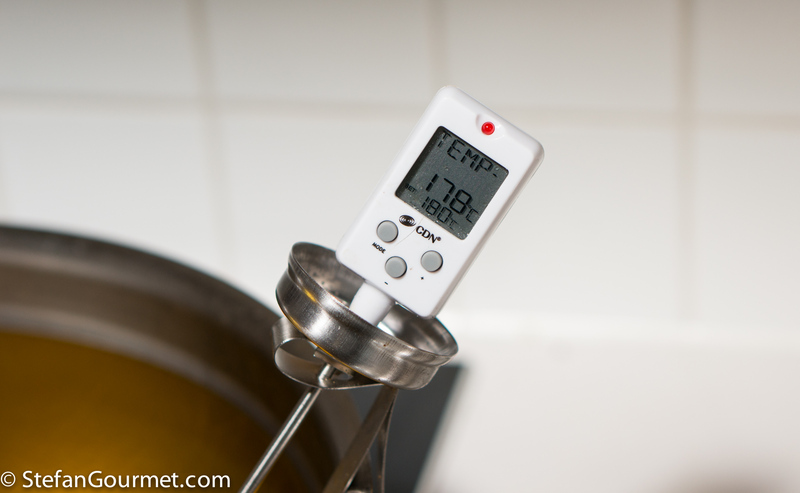 Heat the oil to 180C/350F. When the oil is hot, gently lower the balls into the oil. 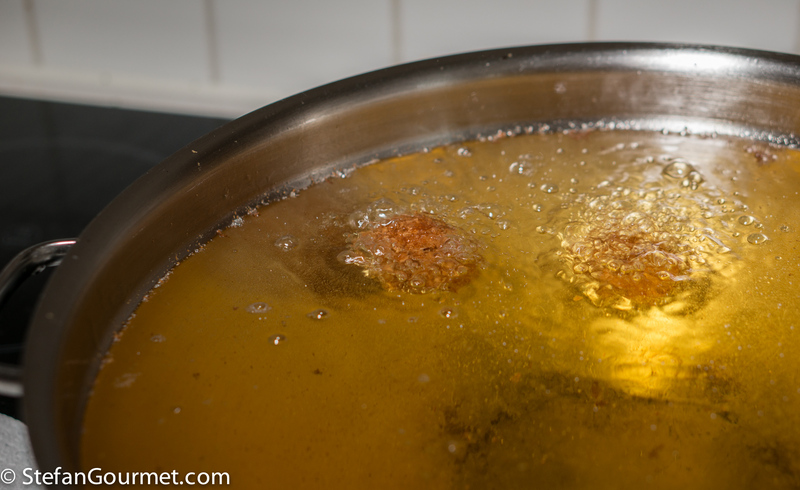 Do not fry too many at once, as otherwise the oil temperature will drop by too much. Deep fry them for about 3 minutes. …and allow excess oil to drain on paper towels. Allow to cool for a few minutes before serving. 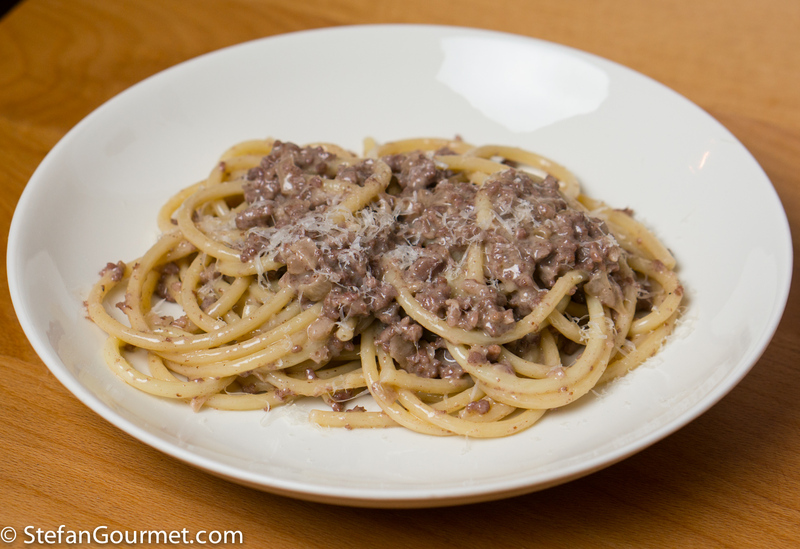 A simple classic from Italian kitchens: spaghetti with sausage and cream. This comfort food can be prepared in the time it takes to cook the spaghetti. 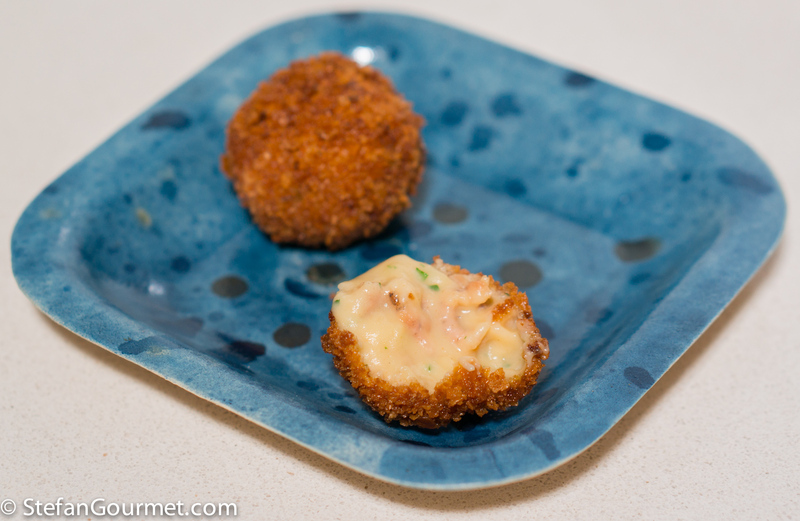 I adore croquettes de crevettes grises. 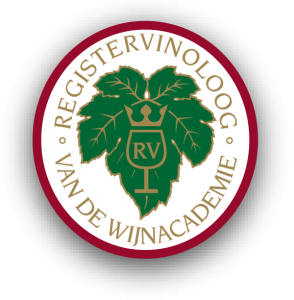 We have them here in Northern France as well. They are quite a bit of work, but so worth it. I’ve never made them myself, but I should pluck up the courage to try, my guests would definitely appreciate! You can count on it! I’m sure you can handle it, it is just a lot of work. 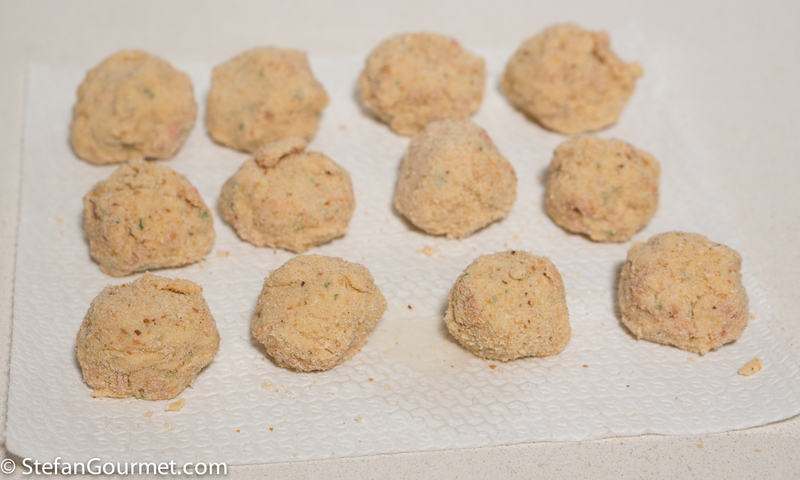 Of course you could make half the recipe of ragoût and 8 croquettes as an appetizer for 4. That reduces the work by a lot. I cannot believe the coincidence (Happy New Year by the way Stefan!) … only a couple of hours ago I was looking at the same recipe as interpreted by Yottam Ottolenghi and was thinking to myself “Oh! I must make this, it sounds delicious” (you know me and how I love my fried foods) ! And next thing I know, Stefan writes about it and provides great photos and instructions (and the addition of parsley which I think is probably vital). I think this is definitely a sign from culinary heaven for me to get started …. Was oohing and aahing over your Venison Rosa di Parma too, by the way … but it’s hard to get venison where I live so probably won’t attempt it. Here’s raising a glass to you ! Oh wow. I wasn’t all that much of a fan of bitterballen when i was staying in Amsterdam, but I really must try them made of shrimp. And besides, we have the little “bay shrimp” here in San Francisco. Thanks for this recipe. I just wanted to tell you that I did the hanger steaks for 12 hours at 131 degrees F in the sous vide and they are PERFECT!!! Thank you again!